I first heard of Bam back in 2003, when I read a piece in the International Herald Tribune about its destruction in an earthquake. 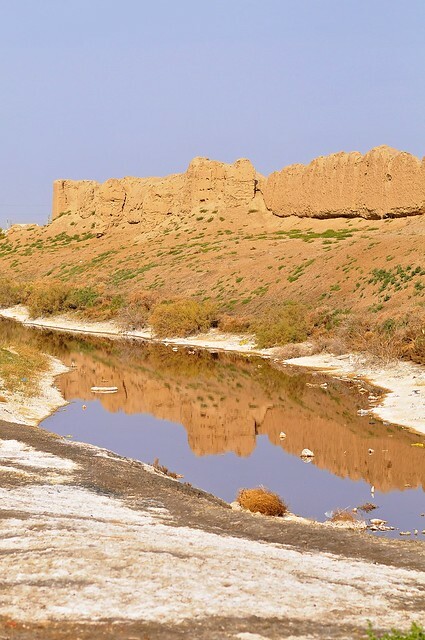 I knew nothing of Iran, and was pretty surprised to learn that such a place as Bam—an ancient citadel with roots as far back as 500 BC, and with most of the surviving mud-brick buildings dating from the Safavid era (1501–1736). I promptly forgot about Bam, but I was reminded of it when I started to leaf through my Lonely Planet and trying to figure out what I should see in Iran. And, in truth, the memory of that news report probably gave me false expectations, as in my mind I had conflated the modern town and its casualties with the ancient town, and come away with impression that Bam had been a town where people had continued to live in ancient buildings until the quake. This false memory was reinforced by a rather vague description in Lonely Planet, which describes that the quake's destroyed the mud brick homes in which most people lived, and forced them to build steel-framed buildings to replace them, but failing to mention that these mud-brick homes were less than 50 years old. Anyway, the reality is that most of the older buildings below the citadel were in ruined or semi-ruined condition well before the 2003 quake, and that only the citadel itself was in good repair at that time. The same is true for nearby Rayen, which was largely spared in 2003. The bus station in Kerman is a bit of a mess, as it is unusually spread out, with different ticket offices in different for different companies and destinations. There are also touts outside offices trying to get people onto their buses before they leave, which can be slightly confusing. Buses to Bam run fairly frequently, but I ended up waiting for about an hour for mine to leave. Bam isn't a major town, and almost all buses will be running through to Zahedan, so the de facto bus stop is a roundabout on the south edge of town. From there is a a few kilometers to Lonely Planet's highly-recommended place to stay, Akbar Tourist Guesthouse. Akbar's may actually be the best option in Bam, but given the dearth of options I don't think that's saying much. I arrived at the guesthouse at about the same time as a couple of Iranians who arrived by car, but we were both stymied by no one being there, so we waited in the courtyard. It was well over an hour before anyone arrived, and the Iranian pair checked in first. I received a bit of a shock when I was told that the price the cheapest room was 300,000 rial, as the recent Lonely Planet suggested the price should be about 130,000 rial—clearly he was doing something like Vali and boosting his prices. Of course, this was especially shocking given that the triple room in Kerman had been a total of 270,000 rial. Akbar said he would give me a discount to 250,000 rial. If he had been there when I arrived, I probably would have walked away and returned to Kerman in the evening, but it was now late afternoon and I wouldn't be able to see the Arg before it got dark. So I ended up agreeing to stay. In all honesty, his place was pretty rough. I know there was an earthquake, but it happened nine years earlier, in 2003. Construction was ongoing and the stairs were completely open on one side, with not even a railing for safety. The rooms were already quite dingy and dirty, with stained carpets. The shared bathrooms had inoperative toilets and showers, and were full of mosquitos. They also lacked hot water, so after I had dropped my bag Akbar let me use one of the bathrooms in a nicer room, but I had to chose if I wanted to use it in the evening or the night. As someone who showers in the morning and the evening, this sucked. In all, it was pretty unimpressive, at any price. But whatever. I headed out to see the Arg, which was another three or four kilometers north of Akbar's. 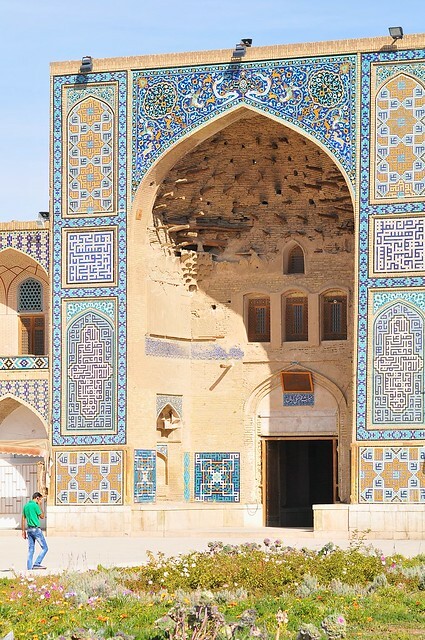 Outside of the historical areas, Iranian cities aren't especially attractive, and Bam was even uglier than most. No doubt this is a harsh assessment in light of the 2003 earthquake (but given the Iran's huge population boom—half the population is under 25—and concomitant building expansion, this isn't as unfair as you might imagine), but the area between the Arg and the highway has a very industrial feel. The Arg at dusk. None of the area pictured here was accessible to tourists when I was there. A little later, a little darker. This is about as god a view as you can get of the Arg. View from the southwestern edge of the Arg complex. Thee walls are one of the few sections of town aside from the citadel that had been reconstructed. The naming of the Arg is a bit confusing, as Arg (or Ark) is usually used to refer to a citadel, but in Bam the entire ancient city complex is referred to as the Arg-e-Bam. The ancient city itself contains a citadel on the northern end, which makes it a little difficult to differentiate whether you're talking about the citadel within the ancient city, or just the entire ancient city complex. A model of Arg-e-Bam as it appeared before the earthquake. The citadel is at the northern end, on the right. Almost all of the domed structures in the bottom half were destroyed in the quake, though the two domed structures at the upper left have been somewhat reconstructed. Shortly before arriving in Kerman, my conversation partner invited me to have breakfast with him. I would have agreed, but I had to find the Canadian couple I was traveling with, as they left the bus ahead of us. When I found them, I couldn't find my Iranian friend, and I felt a bit bad. But maybe the breakfast invitation was just taarof? Anyway, we took a taxi from the bus station to one of the hotels listed in Lonely Planet. I'm not a taxi person in any culture or country, but I got sucked along with the couple I was traveling with. The small hotel we went to was nice but somewhat basic, and the Canadians were shocked by the price, as it was 270,000 rial for a triple room with a private bathroom, TV, and fridge, as well as a shared kitchen. They thought this was the per-person price, but were surprised it was the price for the room. So, basically it was half the price of Vali's, for much nicer accommodation. In reality, this was the kind of pricing that I saw in most of Iran, as the devaluation really did make most things cost less than half (in dollar terms) of what they would have been earlier in the year. Anyway, after stowing our bags, freshening up, and making some instant coffee in the kitchen, we headed out towards the main sight in Kerman: the grand bazaar and Ganj Ali Khan complex. We left the hotel together and walked maybe 50 meters to the main street. As soon as we reached the busy main street, however, I realized something was up. Literally everyone we came across would turn to look at the Canadian couple (both of whom were very white and had sandy-coloured hair), with most of the attention being given to the girl. The males would do a good job of not staring until the passed the couple, but their heads would swivel afterwards, while Iranian girls would openly stare without attempting to conceal it. Within the first five minutes we had been approached in English by at least three people who wanted to talk to us. But when I say we were approached, I really mean that the white guy was approached: it would be improper for these Iranian males to directly address an accompanied female, and I was basically ignored (as I would learn later, the locals probably thought I was an Iranian tour guide or friend who was accompanying them, if they even noticed me at all). It was incredibly surreal to see how different our experiences were, and how much attention was being lavished on these white folks while I passed unnoticed even though all of us identified as Canadian, that I had to laugh. But as surreal as it was to me, the Canadians were totally unfazed, as they had been in the country for a while and were undoubtedly accustomed to all the attention. 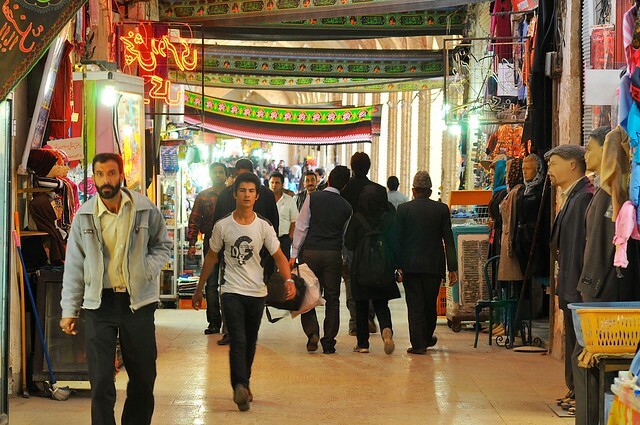 We headed down towards the grand bazaar, which was a pretty nice introduction to Iranian covered markets. 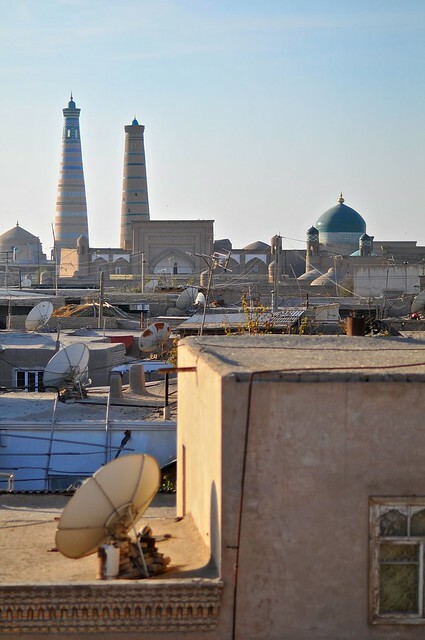 Unlike in most of Central Asia, in Iran there are lots of mosques, markets, baths, and other buildings that have been in continuous use for hundreds of years. These aren't recently-(over)restored tourist pieces like you see in Uzbekistan, but living and breathing buildings that have been maintained and cared for over the years. 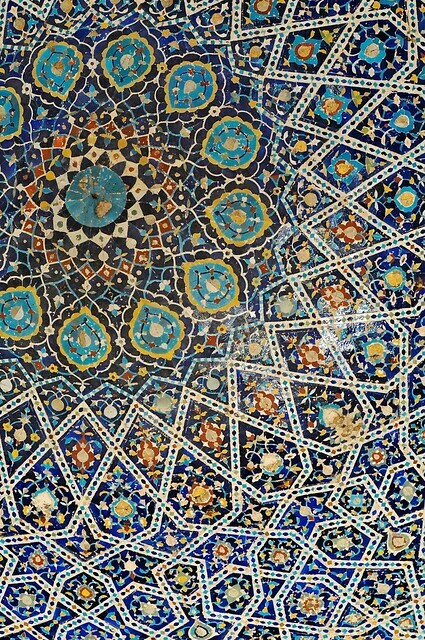 Even in places where the Mongols destroyed buildings in the early 13th century, by the first years of the 16th century the Safavid empire overthrew the Timurids in Iran (which was no slouch in the the architecture department, as Samarkand shows), ushering in "modern" Persia and a prolonged era of stability. 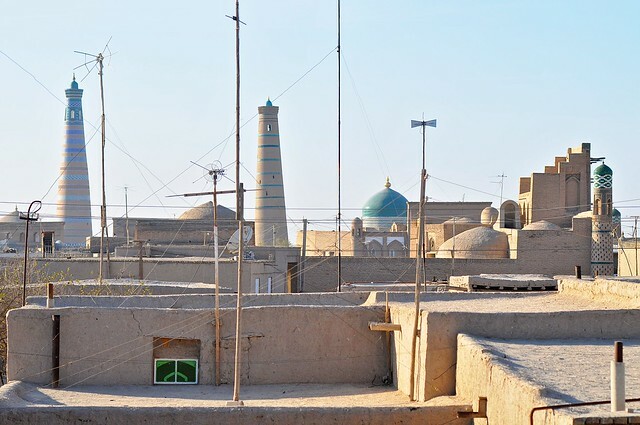 And as Iran has never been colonized, as most of Central Asia was by the Russians, there has never been a move away from these traditional buildings. As a result, the bazaars in most Iranian cities continue to be the exact same sort of traditional bazaars that have existed for hundreds of years: mazes of inter-connected alleys with small domes forming the roofs—though these are barely noticeable from inside the markets, as you're not often tempted to look up and admire them amidst the bustle. These bazaars feel both exotic and, after a while, surprisingly commonplace and unremarkable. Kerman's grand bazaar is located adjacent to the Ganj Ali Khan complex, which contains a large rectangular square surrounded by arched cells (like a madressa), complete with fountains and greenery, and surrounded on the sides with a caravanserai, a mosque, and a hammam (bath). Pishtaq leading to the caravanserai at the Ganj Ali Khan complex in Kerman, built in the Safavid era between 1591 and 1631. Although the large rectangular square looks like a giant caravanserai, the actual caravanserai is a small square courtyard behind the pishtaq. A bagdir (wind tower) along the north end of the square. 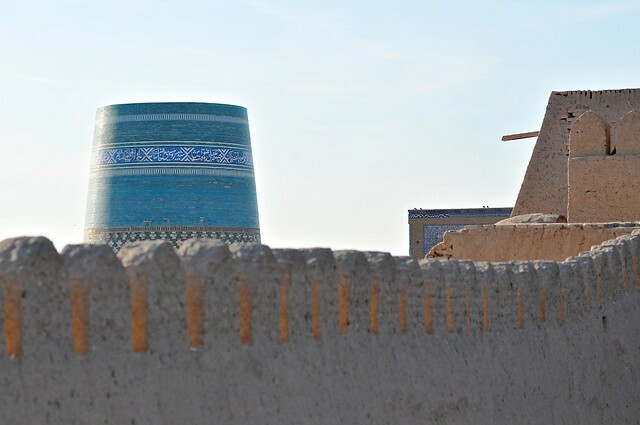 Yazd is the most well-known center for bagdirs, which work by capturing small breezes and funneling the moving air down to ground level, where it often passes over a small pool of water that further cools it. View down the bazaar, which runs along the southern side of the complex. In the morning, after breakfast with my roommates, I set out to find a taxi to the border at Serakhs. I probably could have squeezed in a visit to the regional museum (which is supposed to be quite good), but share taxis typically leave in the morning and I wanted to make sure I would be able to make it all the way to Mashhad that day. The taxi lot is basically the parking lot in front of the train station, near the bus station, and I was able to find a driver without too much difficulty—we just had to wait for additional passengers. I'm something of a Coke addict, so while waiting I bought some samsas from the food vendors next to the station, and also picked up a bottle of Coke. This is a bit of a weird purchase, especially since I was low on manat, but I wasn't sure if Coke, as a western brand, would be available in long-isolated Iran (it turns out I shouldn't have worried, as both Coke and Pepsi have continued to exist since their introduction, likely before the revolution). Although Mary doesn't look to be that far from Serakhs, don't discount how much farther things seem when the roads are horrible. Although even the main roads in Turkmenistan are surprisingly bad for a petrol country, the side roads are even worse, with lots of potholes that result in cars weaving from side to side to dodge them. Most of the ride to Serakhs was on exactly these kind of roads, and it took about three hours to get to Serakhs. We were dropped off a short distance from the immigration post, as there was a huge queue of trucks and cars lined up before the border. Leaving Turkmenistan was relatively painless, aside from again-mandatory border shuttle that we had to take, for the extortionate sum of $2, for a road that is about 1.5 kilometers long. On the Iranian side, things were considerably more complicated, and there a huge number of people in the waiting area. I'm not quite sure how things are supposed to work, but you give your passport to someone, then take a seat in a large waiting area. And then you wait. And wait. And then you'll be summoned, asked a few questions, and then told to sit and wait some more. One of the customs officers—an older, stern looking guy with a grey mustache—talked to himself in Farsi while he looked at my documents, then beamed at me and said "I love you!" before he resumed muttering to himself. I think it might have been the only thing he knew how to say in English, and the contrast between his otherwise grim demeanor and the warmth with which he said it was amusing. He then gestured that I should go sit down again. I was eventually summoned into a commander's office, where I answered some questions and was stamped in shortly thereafter—it appears he was out or busy before then, and for some reason I needed to speak with him. In any event, it actually took significantly longer to process me than it did to process locals, and I suspect that if you entered at a busier border that is more accustomed to foreigners things would be substantially easier. The Iranian side of the border compound is pretty big, with lots of various buildings and inspection points—much more organized and professional than the rather perfunctory border posts of Central Asian countries. One of the interesting things I noticed was a large steel water reservoir with spigots and on each side, as a kind of public water fountain, with one side for women and another for men. Once I made it outside the border area, I stopped by the gate and fired up my netbook. I had downloaded an old version of the Lonely Planet Iran (this was the first country for which I didn't have a hard copy of LP), and hoped to find some useful information on how to get to Mashhad, but it honestly wasn't of much help. Arriving overland usually makes the transition between countries and places much smoother, but in all honestly the difference between Turkmenistan and Iran was even greater than the difference between China and Kyrgyzstan (going between the CIS 'stans is relatively easy in comparison)—or perhaps it is more accurate to say that the differences made it more challenging. In Iran everything looks different. There is no Soviet-style architecture but a lot of narrow, low-rise concrete storefronts with glass windows running the width of them; no Cyrillic, and little Latin, but lots of Arabic script; the people look different, with lots of facial hair for men and hijabs for women; and decent infrastructure with French cars. I was to quickly learn that Iranian drivers are crazy, but this wasn't immediately apparent as Serakhs seemed strangely dead when I headed into the city, and I wasn't sure where I should change money. Of course, the fact that most signs were in Arabic script didn't help matters. I wandered around the city for a while, hoping to find a bus station (or a friendly local to offer to help), but no such luck (this is likely because, as I later learned, I pass as Iranian—if you look white or western you'll have no problem attracting copious attention and inquiries), so I walked back towards the border point. Although I hadn't seen an share taxis nearby, I figured that they must congregate somewhere nearby. It turns out that I was correct, as there is a gas station along the main road to Mashhad, across from the park that separates the border point from the city, and cars to Mashhad congregate at the roadside there. As in Turkmenistan and Uzbekistan, Iran subsidizes gasoline. Not to the extreme extent that Turkmenistan did, but it is still very cheap, which has a salutary effect on transportation prices (as did the massive devaluation of the rial that occurred in early 2012—it dropped from about 1,000 rial to the US dollar to about 3,000 to the USD, largely as a result of increased economic sanctions). I had little idea how much it should cost to get to Mashhad, but I was able to get there for the paltry sum of $3. Again, it helped that the driver wasn't a professional driver but just a private individual going to Mashhad and looking to defray costs, and it may have helped that I had to pay in dollars and they seemed unsure of what exchange rate to apply. The train arrives in Mary at around 2:00 in the morning, and we I pile off the train with a bunch of locals. It's quite cold, and at first I'm a little worried because no one exits through the station building, but from the ends of the platform. On the western edge of the station building is a small, semi-enclosed area full of vendors selling hot snacks, and I stop there to grab a fried pastry. Thankfully, the station building was open, and there were lots of people milling about inside, presumably waiting for the next train. I find an empty bench and sit down and lean back to get some sleep, but a security guard approaches me. I figure he's going to tell me I can't sleep here (none of the locals seem to be asleep), but in reality he's just telling me to watch my stuff to make sure no one takes it. I'm a little surprised by his concern, but thankful. It turns out that I could have taken an early-morning train to Bayram Ali, which is the town just south of the monuments at Merv, but since my plan was to exit to Iran via Serakhs the next day, I was planning on staying in Mary for the night, as it supposedly had a cheap hotel. A few hours later, when the sun was up, I set out to find the Hotel Caravanserai, which was described in the Lonely Planet. unfortunately, the map of Mary in the LP was almost as bad as not having a map at all, as it included streets that didn't exist, and pointed to the Hotel Caravanserai as being in the wrong location. I ended up wandering around some random streets until I ultimately got within a couple of blocks of where the hotel was supposed to be. When I though I was on the right street I asked some local shopkeepers where it was, but they hadn't even heard of it. Thankfully, a passerby heard my inquiries and told me they would take me there. It turned out to be on a small side street, less than 200 meters from the shops where I had been asking, but it had no sign on the outside and appeared to be just another house. Inside the compound, it was really arranged almost like a modern caravanserai, with rooms around around the perimeter of a courtyard (admittedly this is a pretty common layout in many places in the world). I thanked the good Samaritan, and as I entered the hotel to try and find the receptionist or proprietor I was greeted by a couple of guys staying in one of the rooms by the entrance. They invited me to stay with them in their room, and they told me that I could stay with them for free. I later understood that this meant hiding me from the owner, and pretending that I wasn't there, which meant I had to sneak to the bathroom which was located further into the main courtyard. Well, that was fine with me. After dropping my stuff off and having a quick shower, I left to take a look around Mary and go to Merv. How to get to the Hotel Caravanserai from the train station. There are reports that the hotel may be closed, but that may also just be local misinformation. The local workers (welders) who invited me to stay in their room in Mary. I didn't see too much of the town, but I found out from the bus station (just across from the train station) that there was a bus going to Bayram Ali at 11:45. Bus schedule from Mary. The 6:00 bus to Bayram Ali is convenient for those not staying in Mary (the local train at about the same time is probably even more convenient). Gonur is north of Bayram Ali, so those buses probably come close to Merv and may even pass near the entrance gate (but it's also possible they turn north before reaching Bayram Ali/Merv). 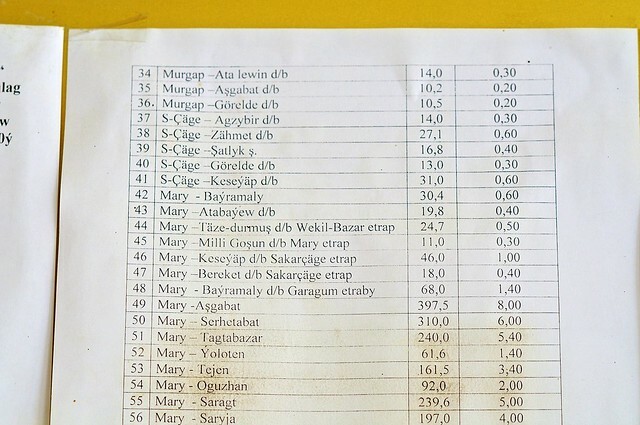 Fare sheet, showing the distance in kilometers followed by the fare in manat. 400km to Ashgabat is 8 manat (same as the sleeper train), or about $2.80. I hopped on the slow 11:45 bus and we dawdled our way east to Bayram Ali. As we got closer and closer, I was increasingly alert for any signs of old walls or any indication where I should get out. I eventually made the right call and got out just before the bus was about to make a turn into Bayram Ali, not far from the Abdullah Khan Kala (infuratingly, the LP map shows the edge of the Abdullah Khan Kala but doesn't show the adjacent roads which would illustrate just how close Bayram Ali is to the sites). Once again the Bradt map trumps the LP version (though it still doesn't show canals that may impede or prevent progress). The bus from Mary turns right at the corner by the bazaar, on the road headed to Turkmenabat, and that's where you should get off. Taxis back to Mary leave from about where the arrow to Mary is. Merv owes its existence to the Murghab River (a different Murghab River than the one we say near Murghab, Tajikistan), which brings water from the Afghan mountains and unceremoniously dumps it into the arid Karakum desert near Merv. Because the Karakum is flat, the Murghab River spreads itself into a wide delta here, and this fertile delta is what is responsible not only for Merv but for the even older Bronze-Age site of Gonur Tepe to the north (possibly the birthplace of Zoroastrianism, the first monotheistic religion), as well as the modern cities of Bayram Ali and Mary. However, because of the flatness of the desert, it's easy for delta channels to dry up and new channels be formed. 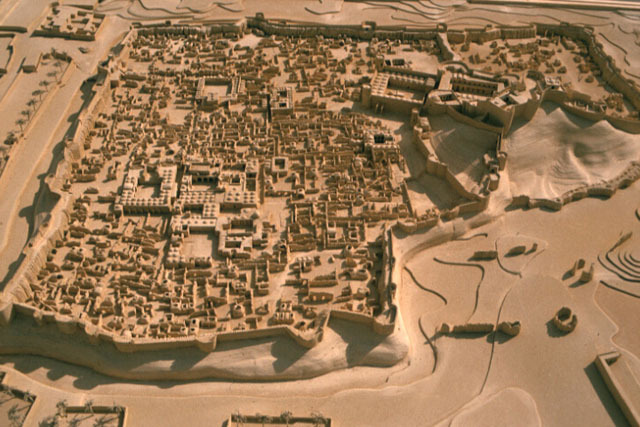 These wandering channels led to wandering cities, as settlements would follow the water over time, with the result that instead of cities being rebuilt on top of each other, we have a succession of ancient cities being built next to each other. 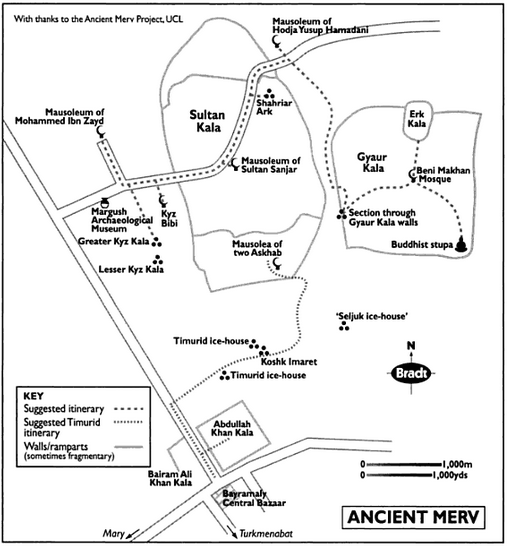 There are two such cities in Gonur Tepe, and five different cities in Merv. One of these cities is the Abdulla Khan Kala, a Timurid city founded by one of Tamerlane's sons after the end of Mongol rule. 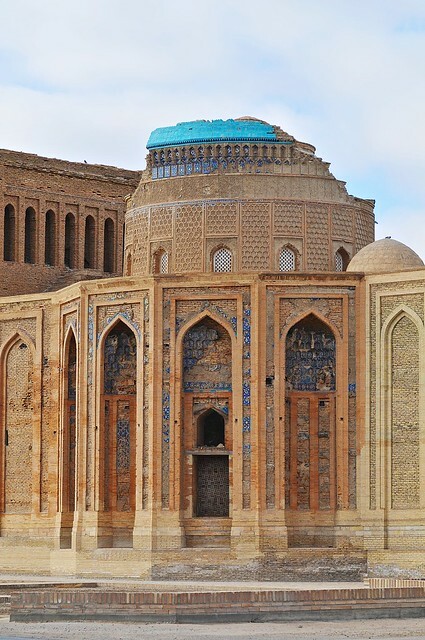 Abdullah Khan Kala suffered from a lack of attention after the Timurid king decided on Samarkand as his capital. There's a moat surrounding the Abdullah Khan Kala, which is basically a huge square compound, of which nothing remains except the brick-faced rammed-earth walls: inside there is just a vast expanse of dirt and some hardy weeds, and maybe the odd goat or two. Even less remains of the the Bayram Ali Kala—the last of the five ancient cities of Merv and which was a western extension to the Abdullah Khan Kala—as apparently it was being used as a source of bricks when the Russians arrived in 1885. The western walls of Abdullah Khan Kala, from near the Bayram Ali bazaar. Maybe "moat" is the wrong word. It's more like a ditch. More than Merv and Konye Urgench, perhaps the biggest tourist draw in Turkmenistan is the Darvaza gas crater, also known as the Gates of Hell (a particularly apt nickname given that Darvaza translates as "gate"). The crater, which is a giant pit in the ground—some 70 meters across— that just happens to be on fire, was created by gas exploration gone wrong: in 1971 the Soviets drilled into a large cavern just below the surface, causing the ground to collapse into the crater we currently see. As noxious gas was escaping from the crater, they decided to flame off the fumes, expecting that it would soon burn itself out. Except it hasn't, and the crater has continued to burn ever since. It turns out that the gas crater is less than 5km east of the highway between Ashgabat and Konye Urgench/Dashogus, and I probably could have seen its glow from the road. Of course, I would have had to know when to look for it, but since I had no idea where we were or even where Darvaza was, this was a bit of a problem. Now, when every cheap smartphone has GPS built in and there are lots of offline maps apps available, it would be much easier to figure these sorts of things out. If I had more time or better preparation I would have asked to be let off at one of the chaikhanas near Darvaza (we actually stopped at a chaikhana for a brief food and bathroom break, and it's actually possible it was near Darvaza, although I didn't see anything glowing), as it's possible to sleep at a chaikhana and hike out to the crater in the middle of the night to see the flames at night and in the early dawn light (again, GPS-enabled maps of your chaikhana and the crater are pretty essential in order to do this properly), and this would be a great way to see them without adding much extra time to your trip. Anyway, on we went through the night, and I managed to catch some sleep, until we came to the outskirts of Ashgabat, whereupon the van made a slight detour and dropped off the girls in the front row to their family in a waiting car. We made a few more stops as we entered Ashgabat, until there were only two of us left. I asked to be dropped off at the station, and then the van departed with the remaining passenger. Unfortunately, this means I have no idea where the share-taxi lot is for people leaving Ashgabat, but thankfully it's not information I needed to know since I left the city by train later that evening. During the drive I spoke briefly with one of the guys sitting next to me. He broke the ice by asking me to put on my shoes because apparently my feet were smelly (likely a sign that Turkmen are more refined than mountain-dwelling Central Asians, as I doubt anyone in Kyrgyzstan or Tajikistan would have batted an eye). He had to do this by pantomiming on discovering I didn't speak Turkmen. Of course, my inability to speak Turkmen naturally led to the question of where I was from. But really, he couldn't get over the idea I didn't speak Turkmen, as though it would be natural that a Canadian would speak Turkmen. This was very different than elsewhere in Central Asia, where most everyone could speak at least a bit of Russian, and understood that Russian was the lingua franca that would most likely be spoken with people from another country or region (although, as I got a better ear for Russian, I was really surprised at how badly a lot of people in rural Uzbekistan spoke Russian, with pretty heavy accents and/or mangled pronunciation—sometimes it was even difficult to negotiate prices). So maybe this is a concrete result of Turkmenbashi's pro-Turkmen propaganda: a firmer and more resolutely-held belief in the value and importance of local customs and language. 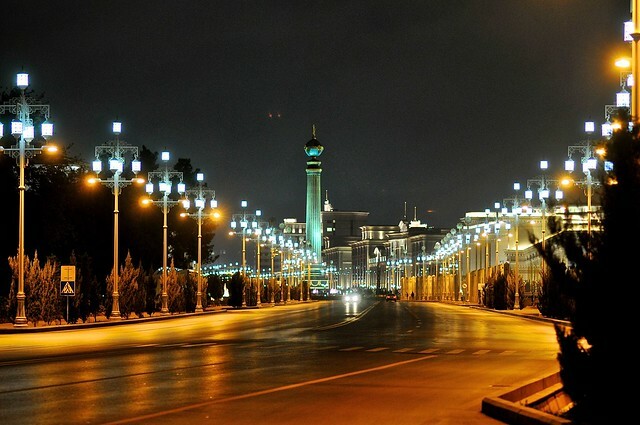 Ashgabat literally translates as "city of love." What it is is a city in love with marble. Well, maybe that's unfair. 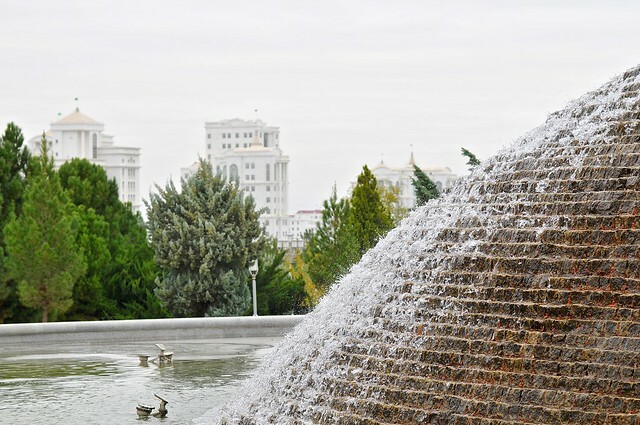 The truth is that Ashgabat isn't that different than Astana in terms of being a modern capital that has been reconstructed and transformed with a spate of new buildings, just that the style of construction is very different. 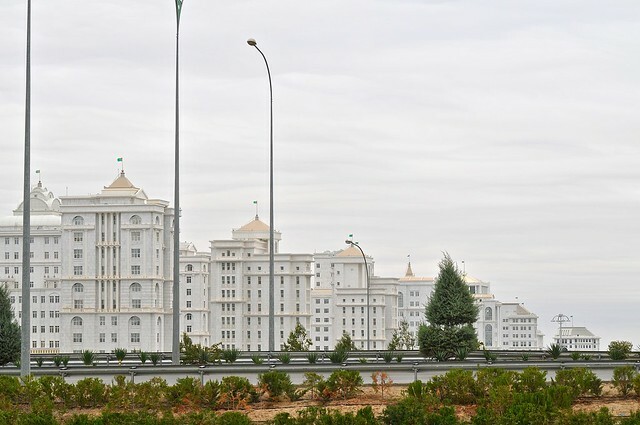 While Astana has consciously attempted to emulate a western style and has courted the famous architect Norman Foster, Ashgabat has taken a more idiosyncratic approach and followed the personal tastes of its nationalistic leaders. 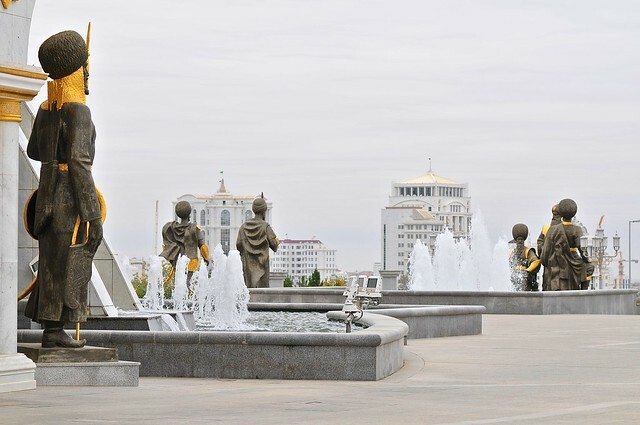 Turkmenbashi, Turkmenistan's long-serving President, was a man who was deeply in love with marble, fountains, and himself. So most of the buildings and monuments constructed before his death are marble, have fountains, and include monuments to himself. 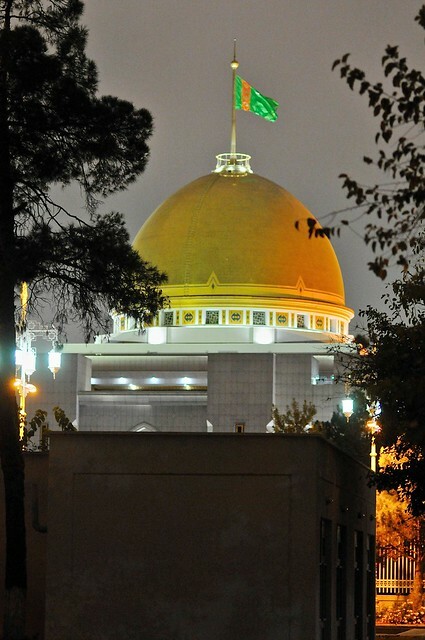 Ashgabat. 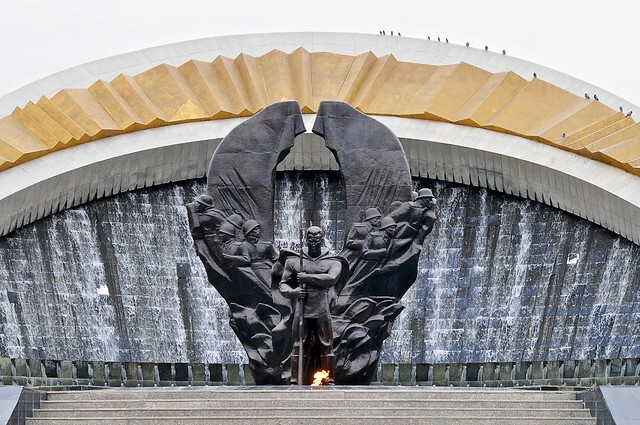 In fairness, Turkmenbashi's successor is less enamored of marble, and the architecture incorporates more glass and has a more modern—though not necessarily attractive—look. Who is this Turkmenbashi, you ask? Well, like most other CIS 'stans, Turkmenistan has had a de facto dictator in power since independence (Kyrgyzstan is the only country that has broken the cycle and has had power transferred between multiple elected leaders in contested elections). Saparmurat Niyazov, who assumed the Presidency after the Soviet Union crumbled, went on to cultivate the most massive personality cult in all of Central Asia, not only doing the rather standard things like constructing dozens of massive statues glorifying himself (in response to public demand, of course), but also going so far as to rename himself Turkmenbashi (leader of the Turkmen) and writing a book called the Ruhnama that was designed to instil national pride and cultural and spiritual instruction. 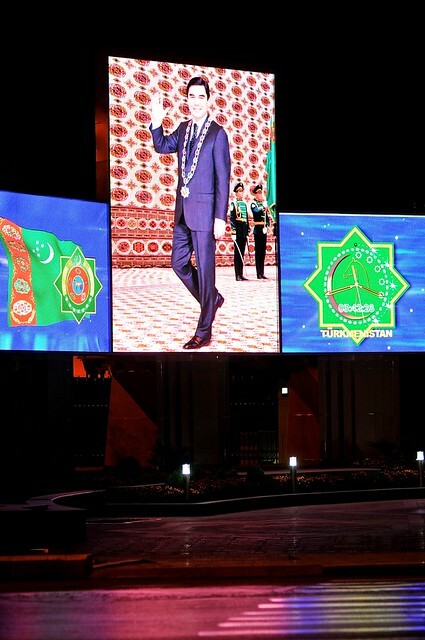 Given this massive personality cult, you might be surprised that Turkmenbashi is no longer President (especially since Kazakhstan, Tajikistan, and Uzbekistan have all had the same leader since independence), but the reality is that the second President assumed office only out of necessity, as a result of Turkmenbashi's death, whereupon power was transferred to his second in command, Gurbanguly Berdimuhamedow. After rolling back some of Niyazov's more outrageous excesses and decrees, and dismantling or moving some of his more prominent statues (including moving the gargantuan "Arch of Neutrality," which included a massive gilded statue of Niyazov that rotated to ensure he was always facing the sun), Berdimuhamedow has started to construct his own personality cult, which although not as excessive as Niyazovs is still greater than you see anywhere else in Central Asia. In the west, Berdimuhamedow is probably more famous for one of his exploits gone awry: after jockeying the winner in a horse race that was no doubt as fair and free as the elections he has won, he promptly fell off his horse and face-planted in the dirt. Apparently his security apparatus attempted to delete all evidence of this from the cameras of those in attendance, but the footage still made its way out. One thing that I found telling is that there was only a slight gasp from the crowd as he fell, and the subsequent reaction was very muted, even though they were clearly assembled to cheer for their beloved leader. 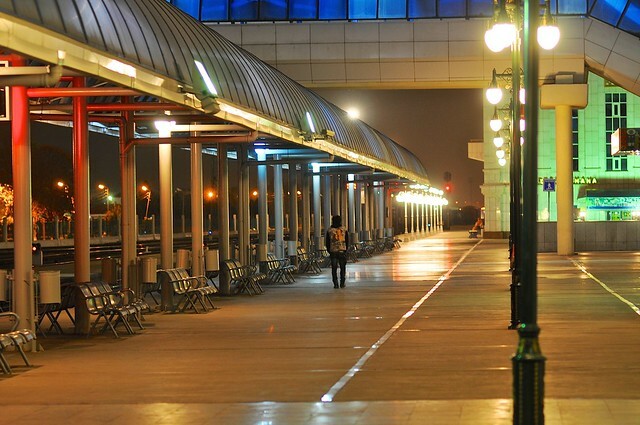 Ashgabat station in the wee hours. We need more billboards of the President illuminated at all hours. As I walked from the station into the main area of the city, I was surprised to find that there were little underground passageways at the main intersections, and that these passageways opened up into small malls about the size of the intersection, lined with convenience stores and shops. Of course, I was there in the middle of the night, so none of them were open, and a security guard quickly showed up to ask what I was doing and shoo me back up to street level. These little shopping areas certainly seemed like they would be more lively than the ones I saw in Busan, however, which is the complete opposite of what I would expect. In general, shops in Ashgabat were modern and clean, with lots of imported things. And because so many buildings in Ashgabat are brand new, it made the country feel quite prosperous: simply visiting Ashgabat without visiting any of the smaller towns and cities in the country would give you a very different impression of what the country is like, as was immediately apparent from my time in poor, ugly Konye Urgench. Turkmenistan is unusual in that Russian seems to be only a minor language, and almost everything is written in Latin script. 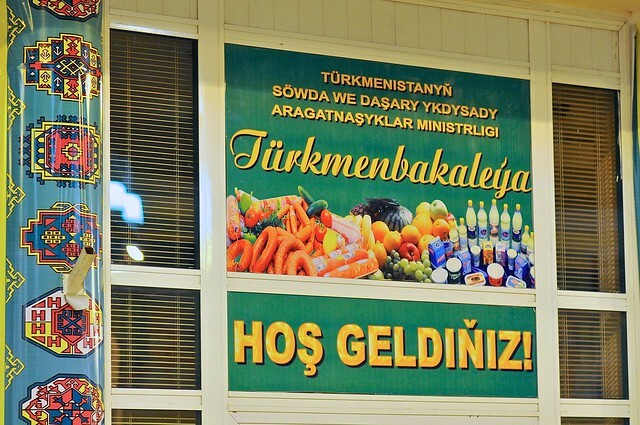 This really reveals the similarity between Turkmen and Turkish (Turkmen, Uzbek, Kyrgyz, Kazakh, and Uyghur are all Turkic languages)—"hoş geldiniz!" also being Turkish for "welcome!" 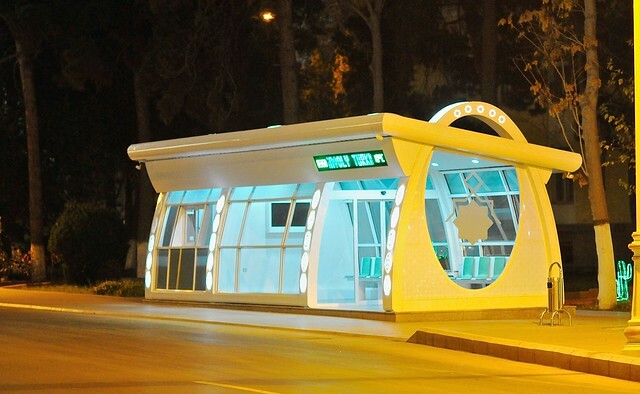 Funky futuristic bus stop, with TV display and air conditioning inside. Down one of the wide boulevards lined with government buildings. They don't like you taking pictures of government buildings in Turkmenistan, or even using sidewalks in front of the most important ones. Dome of President's residence, from out of eye-shot of security guards. As the sun rose I returned to the station, bought a ticket on the night train to Mary (less than $3 for a spot in a 4-berth kupe compartment), and checked my bag into the difficult-to-find storage facility (it's on the east end of the building to the east of the main station building). Bus shelters and stops in Ashgabat have maps of the routes that stop there, and I decided to take a bus to the southern edge of the city, from where I hoped to be able to to take the cable car that lead up the Kopet Dag mountains that form the border with Iran (supposedly in the summer high-ranking government officials have to walk up a path here as part of a fitness-oriented exercise, with the President helicoptering to the summit to meet them). Unfortunately, I wasn't able to find the where the route started, but I did spend a couple of hours puttering around empty plains south of the city, observing wide expressways virtually devoid of traffic on my way back into town. The problem is that I was on the north-south road that eventually leads to the Iranian border while the cable car is considerably to the west, and the TV tower is even further west. Along the road back into town is the long Independence Park, which contains a few monuments and is flanked by impressive buildings. Well, they're impressive if you think that Las Vegas is a classy place, as Ashgabat designers clearly do. White marble, gold domes, and lots of columns are the architectural staples. View through the scraggly Independence Park. The domed marble buildings are the National Cultural Center. The mountains south of town form the border with Iran. That building rising into the mist in the foothills is the TV Tower. The access road to the cable car is located about halfway between where I was and the TV tower. White marble apartment buildings surround the park. Since I was there even more parts of town have been torn down and replaced with rows or modern apartments. For some reason the Independence Monument is more popularly known as "The Plunger." Water cascades down stepped brick in an interesting waterfall. He's wearing the traditional Turkmen fur hat. Continuing north through Independence Park you'll find another interesting building, this time a five-sided pyramid, with each of the corners a cascading waterfall. It's supposedly a shopping center, but was completely closed when I was there. My 85mm lens didn't really allow me to take any pictures, so I kept heading north until I found one of the only banks in Turkmenistan that allow foreigners to get a cash advance from their credit card. I turned up while the bank was closed for lunch, so I killed some time in the adjacent shopping center, which had a huge supermarket on the ground floor and an interesting cafeteria and amusement park and billiard center on the top floor. Supermarkets always interest me, and I wish I took more pictures of them (and quotidian street life): I think that traveling with a smartphone would have really made it more likely I would have taken these kinds of pictures, not least since it wouldn't look so strange and drawn attention. After the lunch break I visited the bank and took out a few hundred dollars, knowing that I would have no chance to get my hands on any more money until I left Iran (it's impossible to use international credit or debit cards there). I met one other foreigner who was doing the same, this one a Kazakh-American working in the oil sector in Ashgabat. From there I took a bus into town, and headed to one of the travel agencies to the east of the government buildings to ask if it would be possible to change the exit point on my visa (I still wanted to try and squeeze in a visit to Herat, in Afghanistan, which would only be possible if I changed my exit point, as changing my Iranian visa to a double-entry would not be possible). The agent said it probably wouldn't be possible but that I could visit the appropriate ministry to try, giving me their address. We had a brief chat about Turkmenistan and the difficulty in getting a visa for there, especially the near-impossibility of getting a visa in October, around Independence Day (October 27, though in practice almost nobody gets a visa valid for the latter half of October). His response—said with a straight face—was that so many world leaders come to Turkmenistan to celebrate Independence Day that the state had to take strict measures to ensure their security. Uhhh.... okay. The travel agency was near the Azadi Mosque, which was clearly modeled on Istanbul's Blue Mosque, though obviously on a much smaller scale. This area of town remains largely Russian in appearance and layout, and is a refreshing change from the institutional and overbearing style of new Ashgabat: hopefully it will remain that way for the foreseeable future (older and poorer traditional-style districts will continue to be the focus, I'm sure). After the mosque, I headed west through the modern park north of the government buildings, on my way to the Russian Market and the nearby immigration building. 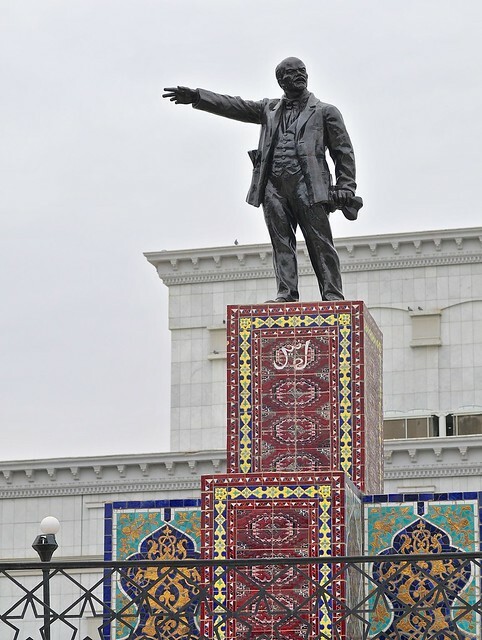 A surprising statue of Lenin, standing on some majolica tiles with Arabic lettering. I'm guessing approximately zero people can read this sign. Ashgabat was leveled in 1948 by an earthquake measuring over 7 on the Richter scale. This is the memorial to the victims of that quake. Not having a wide-angle lens, I wasn't able to properly capture just how big this statue is, but that little golden boy is about the size of a man. 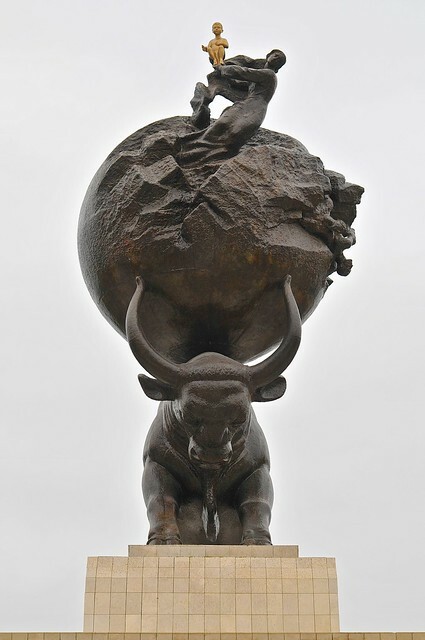 Since he's a golden boy, he's obviously Turkmenbashi as a young boy, being saved by his mother, who died in the quake and left him orphaned (his dad died in WWII). The Russian Market was a bit different than most markets, though the central green market area most closely resembled Almaty's green market: a rectangular area covered by a high roof, surrounded by a balcony arcade. In this market, however, there were more shops on the upper floors and the entire affair felt much more airy and less closed. Again, photographic opportunities were limited because of my lens problem, and I really only had the working space to take pictures from the upper level overlooking the market. When I tried to do so, however, I was immediately spotted by someone, and was quickly approached to be told I couldn't take pictures (also similar to Almaty's green market). After that I went to the immigration building, which was just across the street and a few doors down, and tried to see if I could get my exit point changed. After a few false starts I found the correct person to ask, and was unsurprisingly told that it wouldn't be possible. At least I tried. 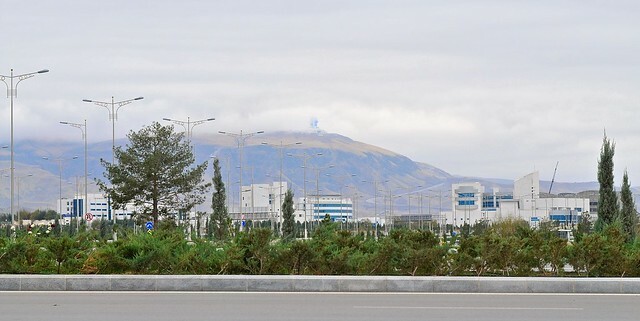 The streets in Ashgabat are a bit weird, especially where new areas meet older areas, as wide roads suddenly squeeze into single-lane roads that head off in different directions, though some of the Russian-style boulevard parks are used as natural borders between the areas. I walked west along one of these narrow boulevard parks, towards the Mosque of Khezrety Omar in a traditional part of town. 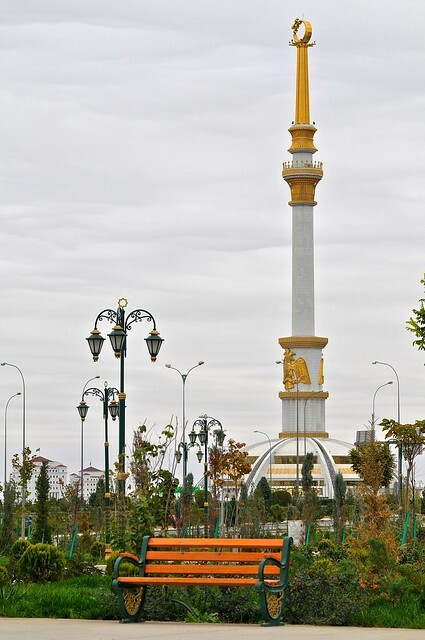 At the end of the park, a short distance from the mosque (which has now been bulldozed to make way for more apartment buildings) was the Monument to Turkmenbashi's Father (who, remember, died in WWII). 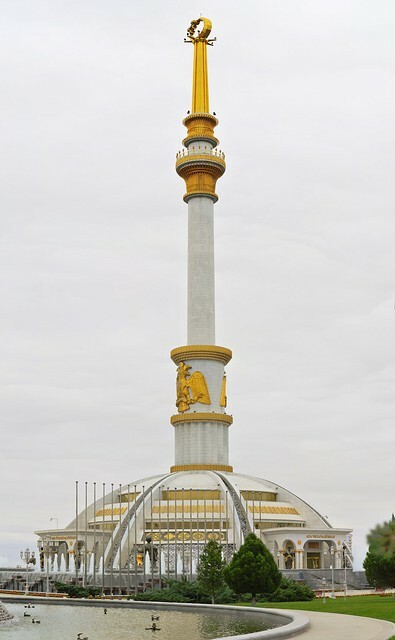 Although this could easily have been retitled as a memorial to war dead in general, current Google Earth imagery seems to indicate this monument has been removed altogether (incidentally, it's fascinating to step back in time in Ashgabat via Google Earth's historical imagery). The Mosque of Khezrety Omar was certainly busier than the Azadi Mosque—people apparently avoid the Azadi because a number of people died while it was being constructed in 1991—but rather pedestrian in appearance aside from its painted ceiling. Although the area is now a boulevard of modern apartments, even then there were signs of impending construction as I made my way to the Ten Years of Independence Park, which was just across from the World of Turkmenbashi Tales Amusement Park. 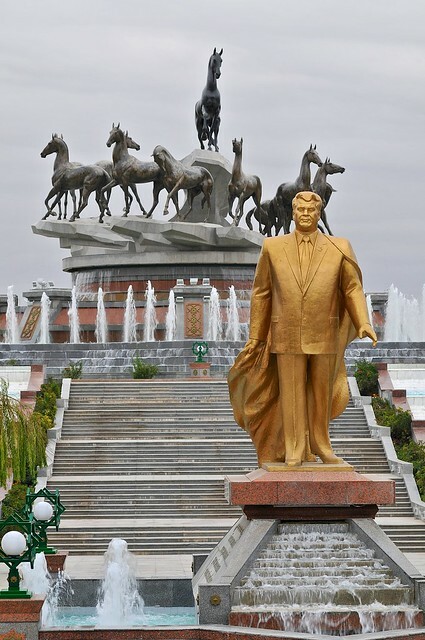 In the Ten Years of Independence Park (not to be confused with the regular Independence Park, of course) there is another giant gold statue of Turkmenbashi—which makes sense since he was President ten years after independence—in front of a giant statue of the Akhal-Teke hoses that are emblematic of the country. Turkmenbashi presides over the Ten Years of Independence Park. It was getting quite dark by this time, so I headed back to the train station and bought some snacks at a nearby supermarket before collecting my bag and having dinner at the station cafeteria. The train to Mary was you standard-issue Russian train, with four comfortable bunks per compartment. I was a little surprised when I entered my compartment, as there were already four people in it, but it turned out that two of them were doubling up on the bottom bunk. I guess they must have run out of tickets, because the cheap train fares couldn't be a realist obstacle. Shortly after leaving the station an agent came around to rent out bedsheets for the trip. I declined, but from the her reaction I would gather that not many people decline them (certainly no one else in my compartment did). Five Graves to Cairo? How about eight rides to Konye Urgench. The day I exited from Uzbekistan to Turkmenistan was one of the very few hard deadlines I had on my trip, as my 5-day Turkmen visa began on the the last day of my Uzbek visa. And because Turkmen transit visas specify the entry and exit border points that must be used, I knew I would have to be at the Khojeli/Konye Urgench border that day. 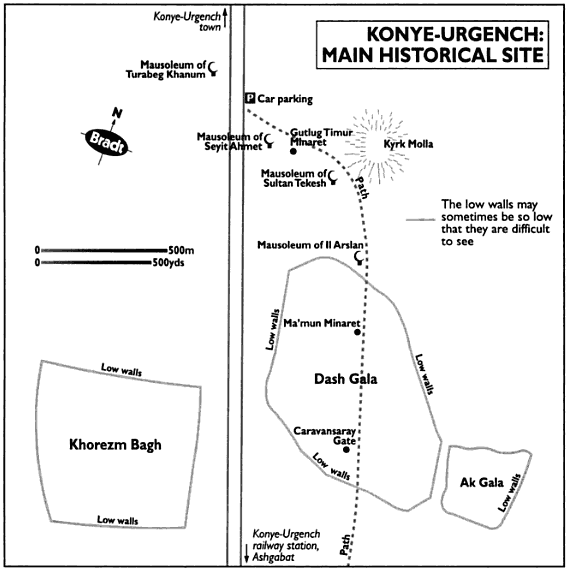 Now, Khojeli is the border between Nukus and Konye Urgench, and given the relative size of Khiva, Nukus, and Konye Urgench, you wouldn't think it would be that difficult to arrange transportation between them. You, however, would be wrong. 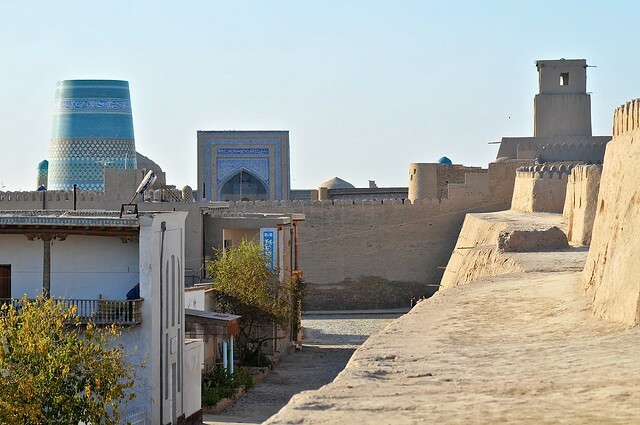 The first thing to do was get from Khiva to Urgench: Khiva is south of the main routes between Bukhara and Nukus, and so most transport not heading across the border to Dashogus instead goes through Urgench. The American guy who was also staying at the Lali Opa was headed into the Uzbek desert and then on to Kazakhstan, so we joined together in taking a taxi to Urgench instead of taking the slow trolley bus. Strangely, however, once we were dropped in Urgench there didn't seem to be any cars heading west, and after searching around the bazaar for a while the American—who spoke pretty decent Russian after a few months in Central Asia—discovered that we would have to go to Beruni to find a ride. In Beruni he helped me find a marshrutka to Nukus, and then we went our separate ways as he tried to hitchike on the main road. After waiting only about a half hour for the marshrutka to fill, we were on our way to Nukus. Of course, it turned out that we only went to the outskirts of Nukus, and needed to transfer to share taxis to get all the way into town. So I piled into a car with some helpful Uzbek babushkas and we were off to the central market. Once there I had to negotiate a bewildering car lot, where cars seemed to be organized according to destination, but really weren't. After futilely asking drivers for a few minutes, a fellow passenger helped me out and found out where cars to Khojeli left from. After the usual wait (pretty short, as the market was busy), it was off to nearby Khojeli. At Khojeli we terminated at the share-taxi and marshrutka lot, where once again it was surprisingly difficult to find out who was going to the border. They had a weird system where, instead of people getting into cars destined for a specific place and waiting for them to fill, people who wanted to go somewhere would kind of just stand around, then magically a car/marshrutka in that destination would be decided and everybody would pile on. But in the meantime you just stand around, which leads to a feeling of tremendous uncertainty (both in terms of whether a vehicle would arrive, and whether you would be able to get a spot in it). After a while a marshrutka for the border showed up and we all piled aboard. By this time it was well after noon, which isn't a good thing when you only have five days in a country (I can understand why cyclists often camp at the border so as to cross first thing in the morning). At the border there were maybe 75 people lined up on either side of the road, in front of a barrier across the road. The customs station was about 50 meters beyond that. I already had visions of a repeat of the endless waiting I encountered at Dotsyk, especially since there was no indication on what side we should line up. A border guard was hanging around the barrier, and I got his attention by standing between the back of the lines, making a shrugging gesture, and gesturing to ask which line I should join. He pointed to the left, and shortly after joining that line he came and beckoned me to the customs house—this was actually another of the hoped effects of getting his attention: skipping the queue by playing the foreigner card (which isn't unreasonable since we pay way more than locals do for visas). Getting out of Uzbekistan wasn't as difficult as getting in, as they didn't really check my hotel registration slips (though they took them), didn't check how much money I was taking out (if you leave with more money than you declared on entry, they may seize it—my dollar withdrawals in Samarkand basically only covered how much I spent in country), didn't check my pictures, and didn't check my computer. There is a fairly short no-man's-land between the border outposts: less than 500 meters, according to Google Earth. I set out to walk it, but the border guards stopped me and told me that you needed to take the shuttle bus between the outposts. No foot traffic was allowed, so I reluctantly got on the bus with the locals, whereupon I had a problem paying: I had already used all of my Uzbek sum (except for a small 500 som note for souvenir purposes), I had no Turkmen Manats, and the only small demoninations I had in dollars were the $12 I knew I would need as an entrance tax for Turkmen immigration. The fee for this short little shuttle was something like $1, on the other hand, a substantial portion of which no doubt went to the border guards who forced everyone to take the van. Thankfully the driver agreed to accept my Canadian $5—the only other small bill I had—but this caused some confusion as they discussed what the conversion rate should be. I think they must have confused the Canadian exchange rate with the Euro (or confused the colourful Canadian bill with a Euro note) because I ended up getting a weird rate, such that the value of change I got back (in a mix of useless som and manats) was actually greater than the value of the dollars I gave them—even if considered as US dollars, and not Canadian. Their confusion later caused some confusion on my part as to what the proper exchange manat exchange rate was, as based on the change I received it should have been about 4 to the US dollar, but in reality it was 2.85 to the US dollar (the exchange rate was fixed at 2.85:1 for a long time, though it changed to 3.5:1 in January 2015, likely to reflect the devaluation of the ruble). As we rumbled across no-man's land, looking out at the barren land, I had the strangest impression that it was winter—even though it was close to 20°C. I cam by this feeling honestly, however, as the marginal soil was white with salt stains, and bits of white fluff (cotton? pollen?) were floating in the air–in combination with the brown and leafless trees it all gave the impression of light snow. Very bizarre, but very convincing. This salty soil seemed characteristic of much of Turkmenistan; it's a good thing they have oil and gas, otherwise they would be in trouble. Turkmen customs and immigration was different than I was expecting. Their systems were fully computerized and all entries were logged, which was actually a bit disappointing to me since it meant it probably wouldn't be possible to bribe my way out of a different border, and to cross to Herat. You have to pay a weird $12 entrance fee at the border to get into the country, which is a bit weird since you've already paid for a visa. I think they usually have change, but I figured they might not since they probably don't get many foreign visitors through this border point (or any), and I had $12 exactly. Paying the entrance fee and getting stamped into the country was sandwiched by getting my bag x-rayed and then inspected. One of the military guys assigned to the border post was a young guy who was eager to meet a foreigner and talk with me a little bit, and he was really friendly. I'm guessing that conscription is alive and well in Turkmenistan and that he had other things he would rather be doing. His colleague took his job more seriously, and was preparing to do a deep dive into my bag when the younger one waved him off and asked him why he was going to go to all the bother. The older one kind of rolled his eyes, but stopped searching. After being stamped through and leaving the border point, we got onto one of the waiting shuttles to drive into town. Hotels in Turkmenistan aren't particularly cheap for what they offer (partially because they are the only one of the CIS 'stans to continue to have foreigner pricing at official hotels, though it's usually phrased as a discount for Turkmen citizens), so when one of the other passengers in the marshrutka, upon hearing me name a hotel as a destination, insisted that I save my money and stay at his house (he had all been together since Uzbek customs, so he knew I had no manat), I accepted his kind offer. He lived on the northeast outskirts of town, a bit of a walk from the main road, but it was interesting to see a local neighbourhood. It, like pretty much all of Dashogus, was a relatively poor looking town, with older traditional Soviet-Central Asian architecture that wouldn't have looked out of place in rural Kyrgyzstan or Tajikistan. But at least he was at home with his family, unlike so many working-age men elsewhere in Central Asia. At his home I met his wife and children, and after a simple dinner he popped in one of his favourite DVDs—a Shakira concert (globalization indeed! )—and we watched her hips not lie. Cheap pirated DVDs are ubiquitous throughout Central Asia, with fare running from Hollywood blockbusters to traditional music from around the region. Water for washing was from the usual jug and basin, much as in rural Sary Mogol, and the toilet was an outhouse on the other side of a small field behind his house. Although I always carry my own paper (wet wipes are great), as everyone does, there was a pile of rough, cheap paper that turned out to be pages from a mathematics book nailed to the wall. This kind of impoverishment would stand out in stark contrast to the excesses of Ashgabat, and when my host commented that Konye Urgench is an Uzbek town where almost everyone is ethnically Uzbek, I wondered if this was another layer in marginalization (like Uzbeks in Kyrgyzstan or Pamiris in Tajikistan); the only minority ethnicities who seem to have it okay are Tajiks in Uzbekistan (Bukhara and Samarkand being ethnically Tajik), though the Uzbeks retaliate by making relations with Tajikistan as difficult as possible. The next morning, as I prepared to take my leave, I asked my host to point me in the direction of the nearest bank to change money. To my surprise, he insisted on accompanying me, even though I said it wasn't necessary. He said he would go with me and help me change money. On the way into town we passed a bank, but we didn't stop there to change money (which made me a bit suspicious) but headed to the market. In the market he found a guy to change money, but the money-changer really wanted the transaction to be surreptitious, as though changing money (on what I assumed was the black market) was really serious. This seemed weird, as black market transactions in Uzbekistan and Burma are all done in the open, but he insisted on keeping everything out of sight. I'm still not sure what the big deal is, as by all accounts there is no black market in Turkmenistan and currency is freely exchangeable in both directions (i.e., they will change your manat to dollars when you leave at the same rate), and this market changer gave me the exact same 2.85:1 official exchange rate. Bizarre. Anyway, after this, I thanked my host again, and expected us to part here. Probably I should have given him some money even though he had insisted I save my money by staying with him. But he said that he would accompany me and help me find a taxi to Ashgabat, where he could get me a ride for $30. Uh oh. According to Lonely Planet, a taxi should only cost 30 manat, which meant that he was clearly going to try and take a cut of this $30 for the $11 ride. This kind of put his "hospitality" in a whole new light. I told him that I would be OK finding one on my own and wanted to visit the monuments first, but he said he would accompany me. Things got worse when we arrived at the archaeological zone, as although he accompanied me as I bought my admission and photography tickets, he really only wanted me to look at the first building and then peek at the minaret across the road before coming with him to get a taxi. He really didn't want me to take pictures, saying as it would cause problems for him. Now, maybe this would be a legitimate concern in this paranoid country, but since I had just bought a photography permit it didn't make much sense—my host tried to say that you could take one or two photos, but not many, and was eager for us to leave. I returned to the ticket booth, and asked the attendant there (who spoke very good English), and he said that I could take as many photographs of whatever I wanted. I obviously wasn't going to leave after only spending five minutes there, and my host decided he really didn't want to wait around for me, so although I thanked him for his hospitality I think it's safe to say we were both frustrated and disappointed with each other when we parted: he didn't get the payout he was hoping for, and I felt as though he was taking advantage of me under the guise of hospitality. Anyway, I left my bag with the helpful and knowledgeable ticket attendant (I left it outside his little shack, but he kindly moved it inside with him—something that made me a bit nervous when I returned and didn't see it sitting where I left it) and headed across the road to explore the other monuments. 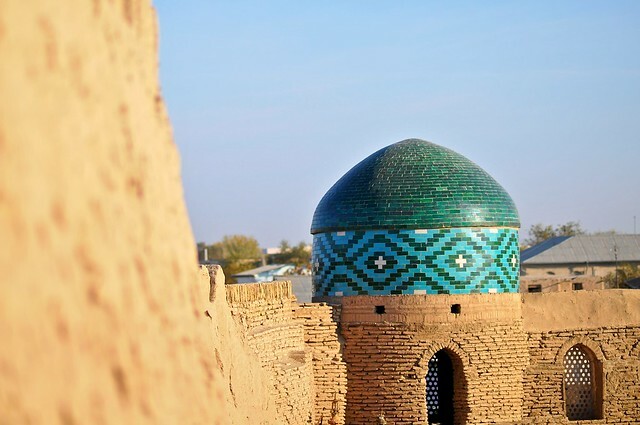 Konye Urgench was the heart of the Khorezm empire which ruled the Amu-Darya delta area from the 10th century to the Mogol invasion in the early 13th century. 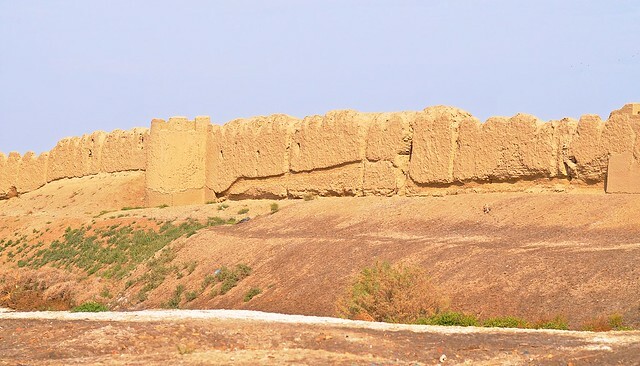 The city was later abandoned when the Amu Darya, which formerly ran through the city, changed course and took up its current position through Nukus. The abaondonment of the city helped preserve the monuments, which are now a UNESCO World Heritage site. The first building you come across on the road south of town is the Turabeg Khanum building, and it's one of the most interesting and impressive in Turkmenistan—though it would be a lot more impressive if it weren't right next to the highway with a big parking lot in front of it. The design of the building includes multiple references to the calendar, with the dome tiles having 365 sections representing the days, the lower level under the dome being a 12-sided dodecahedron to represent the months, four windows to represent the weeks in a month, and a tier of 24 arches between the ground level dodecahedron and the dome to represent the hours in the day. This building is usually described as a mausoleum, though apparently there are many who are less certain, given the lack of grave markers and other discrepancies. 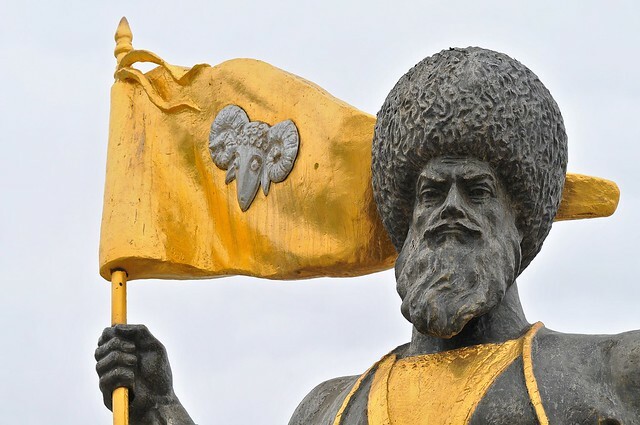 If you remember from Samarkand that Bibi Khanum was Tamerlane's wife, you wont be surprised to hear that Turabeg Khanum was aslo a female: this time she was the wife of Gutlug Timur (who restored the Gutlug Timur minaret) and he daughter of Uzbek Khan (who was the khan when the Golden Horde converted to Islam). Bradt beats LP hands down for accurate, helpful information (but the most recent edition is from 2006 and is currently out of print). 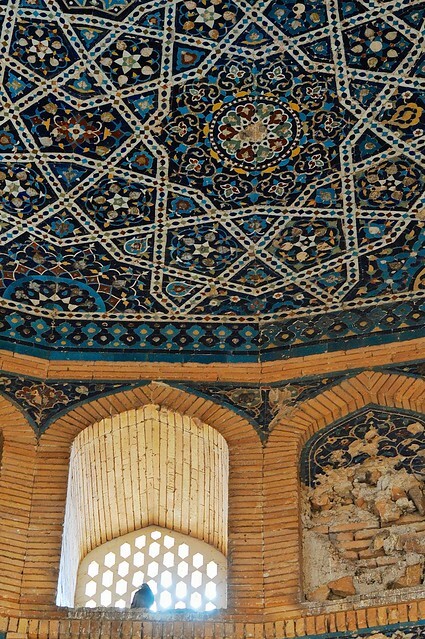 In Uzbekistan this would be the basis for a restoration, not the result of one. Here, the exterior wall follows the 12-sided interior dodecahedron. There are four of these big windows just below the dome. 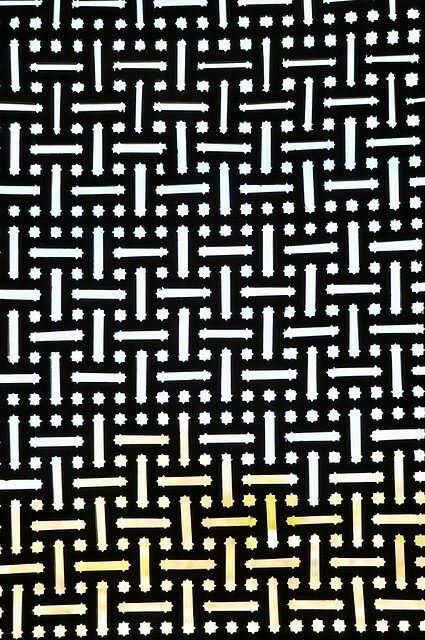 There are 24 of these arches, representing the hours in a day, and below them are the 12 arches in a dodecahedron. A better picture of the entire dome and the two tiers of arches can be seen here. The tiles apparently divide the dome into 365 different sections. Getting from Bukhara to Khiva took one full day, and was not a fun process: far better to take the night train from Samarkand (or Tashkent). Even if you're dumb, like me, and visit Tashkent, Samarkand, and finally Bukhara in geographical sequence, it would still be better to backtrack from Bukhara to Samarkand just to take the night train. The reason I say this is because the road from Bukhara to Urgench is really bad, and in order to take it you'll need to get a ride in a shared taxi. As with other places, getting a shared taxi often isn't fun, and often involves hours of waiting around. 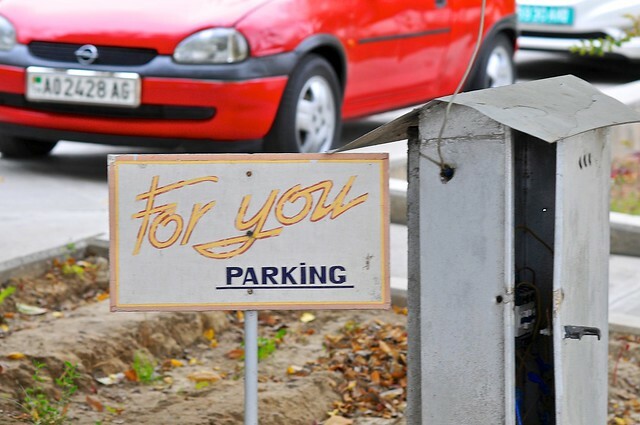 For me, the taxi process involved showing up at the bazaar in the morning, negotiating with a driver until we reached a reasonable price, then waiting in the car while he solicited more passenger. Then, after an hour of waiting, he returns to the car with three passengers who want to go somewhere else, so tries to kick me out of the car, while I argue with him for a while and tell him to find me another driver going to Khiva or Urgench for the agreed price. He finally does, after first threatening to run me or my bag over. Then it's another hour waiting for the other car to fill up, followed by a half hour of driving around Bukhara in search of something. I had assumed we were looking for cargo, but after slowly driving past a few fuel stations where no fuel was being pumped but whose long lines of cars—some parked until the station started pumping again, others with driver asleep inside or nearby—at the entrance would make the 1973 oil crisis look minor in comparison, I understood we needed to get some gas. This was followed by us starting our drive outside of town, then the car sputtering to a stop. After a few phone calls, another car shows up and hooks up a rope to tow us. We are then towed not into the city, but into the country, where we were taken to a fuel station that was open for service. There we popped the trunk and filled up the LP tank that so many cars in the region run on. Finally fueled up and ready for the road, we set off on the bumpy hell-hole of a road (one would think a road through the desert would be fairly easy to maintain, but the potholes and eroded tarmac said otherwise) to Urgench. At about the halfway point we made a stop, and one of the ladies in the back who was traveling with her daughter (they were sharing a seat) asked to change places with me; I was in the coveted front seat, which the first passenger inevitably secures. I was kind of surprised, because everyone knows the front seat is the best and I've never seen it conceded, nor anyone ask for it if someone else was in it, but I relented and got to be squeezed in the back. Between the time spent waiting, the time spent getting fuel, and the poor road, it was well after dark when we pulled into Urgench, and were deposited just north of the train station (a brand new and gleaming facility, though they don't get many trains out there). A bus pulled in at about the same time, and there were some taxis milling around. Not many were going to Khiva, which is about 35km away, but one woman who was going there teamed up with a driver to try and scam me. Well, really she's the one who tried to scam me, saying that we could split the cost of the car to Khiva, and that if we each paid 25,000 sum we could leave immediately. This was half as much as I had paid from Bukhara (which is over ten times further, on worse roads), and although she insisted she would have to pay the driver just as much (which he confirmed), it was clear that I would be paying for more than the car would cost and she would take a cut of the money after pretending to pay the driver. Oh, Uzbekistan, how predictable you're getting. I refused, and ended up being taken to a nearby restaurant and guesthouse by a local. I was a little surprised they would let me stay (since they obviously weren't set up to take foreigners and didn't issue registration slips), but it was only $5 a night for pretty basic accommodation with a slightly grotty shared bathroom. The next morning I set out to try and find the trolley bus that runs between Urgench and Khiva, which was actually fairly difficult since LP is predictably vague on the details of where to catch it. I ended up walking to the outskirts of town, and starting down the road to Khiva, thankfully ignoring one stretch of overhead lines near the center, as they didn't actually serve this trolley bus. As I walked along the trolley line towards the stop I was able to get a closer look at cotton crops in the field: they were dry scraggly little plants in parched soil, quite unlike the steamy and humid conditions I associate with the American South, which is the place I most associate with cotton. 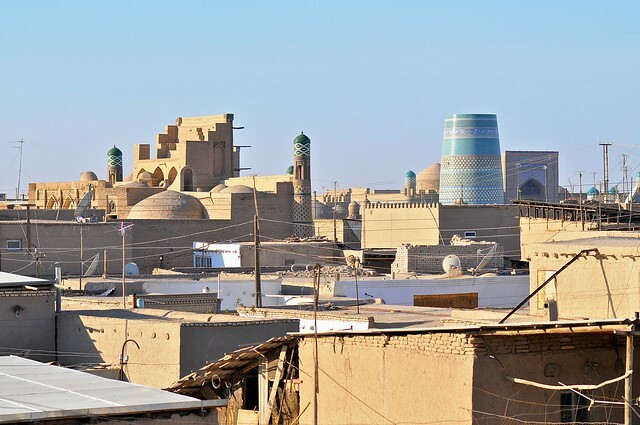 Khiva, like all Khorezm sites in this arid region, owes its existence to the Amu Darya (aka Oxus) river and the fertile delta it formed as it emptied into the nearby Aral Sea. The Amu Darya river is the product of the confluence of the Pyanj river (which we saw in the Wakhan valley, and which forms much of the border between Afghanistan and Tajikistan) and the Vakhsh river (which is what the Kyzyl suu river that we first saw in Sary Mogol turns into in lower Tajikistan): it's amazing how these rivers we saw over a thousand kilometers away continue to shape and inform the cultures we see weeks later. The Amu Darya is also what led the Soviets to decide that intensive cultivation of cotton was a good idea, a decision which has disastrous consequences for the Aral Sea, whose eastern shoreline has receded by over a hundred kilometers and which now contains only 10% of the water it held only 50 or so years ago. I mean, cotton in a desert: who could have seen this coming? Once on the slow little trolly bus from Urgench, the ride to Khiva took about an hour, during which time we trundled through these bizarre fields of cotton and other crops before being deposited next to the northern gate of the Ichon Qala, or walled city. This drop-off location allows for a pretty inspiring introduction to the city, as it's just inside the northern gate that you can climb the walls and walk along the ramparts, getting nice views of the old town. Just inside the northern gate. Looking south over the rooftops of the walled city towards the main monuments. The taller minaret of the Islam Khoja madressa is on the left, while on the right is the shorter minaret for the Juma (Friday) Mosque. View south from the western ramparts. 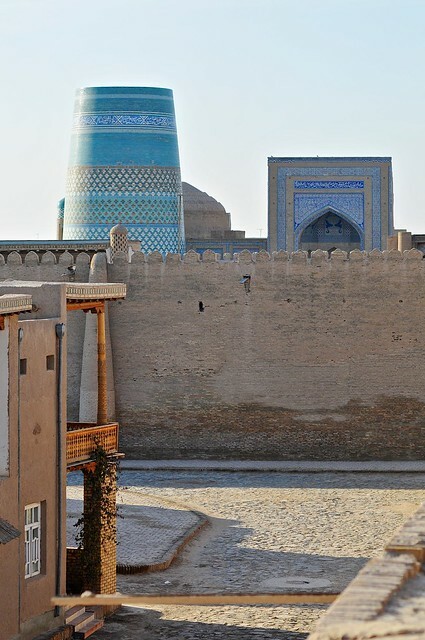 The iconic, unfinished, Kalta Minor minaret over the walls of Khiva's Kuhna Ark. A view from the northwest ramparts. The watchtower of the Ark is the tower on the right, and its walls are the limit of how far you can walk on the ramparts. On the left is the Kalta Minor, and next to it is the iwan of the Muhammed Amin Khan madressa. It's interesting to look out over old-city rooftops, though I'm surprised they aren't used more extensively as living or sleeping spaces. An oral guide to yurt construction in Kyrgyzstan. Where do I put the (toilet) paper: in the toilet or in the bin? The Land of Snows - a great resource for travel in the Tibetan regions of China, including those outside "Tibet"